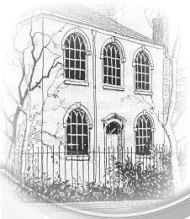 Our Grade II listed church building is 222 years old and generally in good condition, with modern amenities including a full-access toilet and a lift beween the main floors. But recently we have had to spend £16,000 on essential repairs to the frontage and part of the roof. This has almost drained our reserves and we are mounting a series of fundraising initiatives to build them up again so we can continue to maintain the building and provide space for community activities as well as our own services and events. We hope you will be able to support our fundraising events as and when advertised, but if you would like to make a donation now, please click on 'Donate' below!